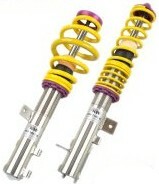 Get newfound aggressive stance and performance with a set of KW Coilovers!!! Is your Audi looking a little too high? Do you still feel insecure about the sharp turns you attempt around the corners? Is your current body kit not doing the job of creating that AGGRESSIVE appearance? 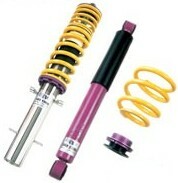 Treat your vehicle and yourself with the best suspension system out there--KW's Coilovers! Not only does this system lower your car perfectly, but it provides HUGE performance benefits. KW designed and manufactured every coilover to CUSTOM fit your vehicle, unlike other coilovers that may be a "special one-coilover-fits-all", these KW Coilovers guaranteeing MAXIMUM handling and performance for your vehicle. Along with handling, this system makes sure your car is given a perfectly AGGRESSIVE stance, not a vehicle that's touching the floor. With KW's patented dampening technology they do not only give you a aggressive feel through the turns but also helps with acceleration. 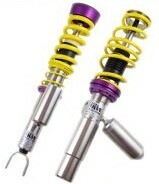 With less rear sag and perfectly tuned rebound KW coilovers are able to cut time off your 0-60 time as well. Maybe you're not the one for aggressive looks and ultimate performance, but for comfort. Well, KW took that into consideration, and integrated adjustable comfort technology. Coilover struts in stainless steel technology, "inox-line"
KW is known for their signature colors, individuality, quality, and security. Take a look below to read more into which KW Coilover Variant is the BEST option for you! Rebound adjustment, with the exception of specified vehicles, can be performed with the kit installed via an adjustment spindle on the end of the piston rod. The rebound damping primarily, controls pitch and roll of the vehicle, especially in the low speed damping range which directly influences handling and comfort. Therefore vehicle can be adjusted to the needs of the driver, making the ride variable from comfortable to sporty and stiff, both with improved road handling. 69 Coilover strut housing in galvanized steel construction.